Volunteers are a vital part of Lighthouse, and there’s a lot you can do. Give back by investing your time and talent in helping children, youth and families in need. We offer a variety of creative ways you can make a real difference. Daytime, evening and weekend opportunities are available. Our Street Outreach Team helps runaway and homeless youth find safety and stability by connecting them to basic needs supplies and resources. You will accompany staff as they talk to youth on the streets; distributing food, hygiene supplies, and harm reduction supplies. Your primary responsibility will be to support staff on outreach. Street outreach breaks with tradition by taking services to youth, rather than expecting them to come to the organization. Direct Service volunteers bring energy, expertise and enthusiasm to what they do and enhance Lighthouse services on many levels. There is a variety of opportunities to work directly with youth throughout the year, both short and long term. Help Lighthouse collect various items for children, youth and families in need such as: school supplies, cleaning supplies, linens, kitchen items, baby items, bottled water, hygiene supplies and blankets. We are always in need of items to help our children and families. Take a look at our latest wish list. Volunteering in a community garden is a great way to give back to your community. The garden at the Lighthouse Community School in Madisonville always needs a helping hand- no gardening experience necessary. The garden at the corner of Ward and Chandler Streets provides fresh food for neighbors, facilitates job training for students, and is home to a garden market. Volunteers provide meals to youth at the Lighthouse Sheakley Center for Youth, the homeless shelter for 18-24 year olds, and at the Mecum House, which serves 10-17 year olds. You sign up to prepare lunch or dinner for the shelter’s youth on a designated day. Meals can be made at home and dropped off or cooked in our kitchen. Your gift does so much more than provide a nutritious meal. It tells the person receiving the meal that you care and want to help them. Share your talents and energy with Lighthouse! Support children and families in need through volunteering, fundraising, and advocacy in an atmosphere that promotes social connections and professional networking. Click here to learn more. Volunteers also pitch in to help with special events like the Fall Fundraiser, and the opportunities don’t end there. Please call Volunteer Coordinator Tessa Barnard and she’ll help you find the volunteer options right for you. You can reach her at (513) 487-7122 or tbarnard@lys.org. If you are interested in an internship with Lighthouse, please email your resume and internship requirements to: intern@lys.org. 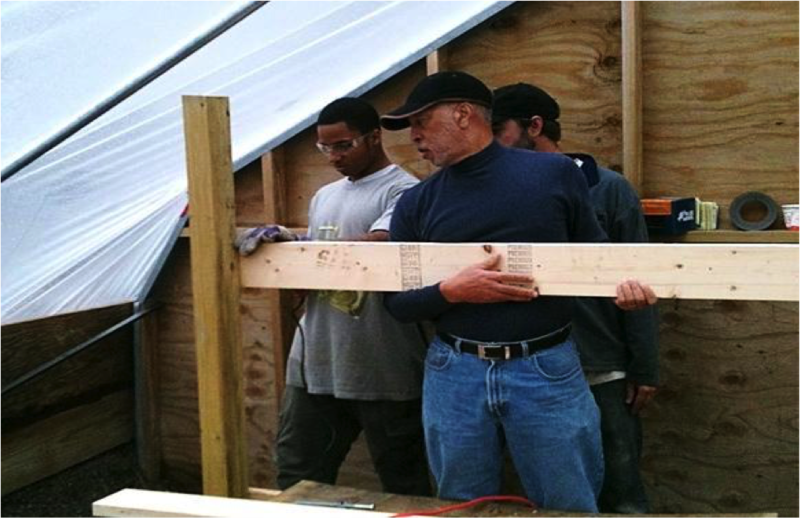 Volunteers help to rebuild community greenhouse for Lighthouse Garden Project. Donations made during the holiday toy drive that will go to Lighthouse kids and families.